And, no, this is not a photo from my trip to Nicaragua with WaterAid America. This ladies toilet was found in Maine behind a historical site. What a fun find! So glad those days are behind us. I really like my bathroom with running water and flushing toilets and lights in the middle of the night. Me too, Michelle! I was reminded of this when I was in Nicaragua last March. Not going to lie, this is one of many reasons I am happy to be alive now versus years back. But still great find and can’t believe this is still around after so many years! There was a much more modern toilet in another area. Seeing this old one made me chuckle. I wonder how old it is. I definitely would NOT want to ‘go’ in there! Maybe if it were an emergency. But it wouldn’t be my first choice! Haha, that is amazing that you came across that! Is it still in use? I don’t believe so. Biz used a different bathroom not too far away. I am curious as to why this one is still there though! anotherjennifer recently posted..Last I checked, July is too early for back to school shopping. It does. Though the one I used in Nicaragua was much worse. Very steep steps! Oh wow. I can’t even imagine. Tricia recently posted..Do you know how your clothes were made? It seems to be missing part of the roof too. 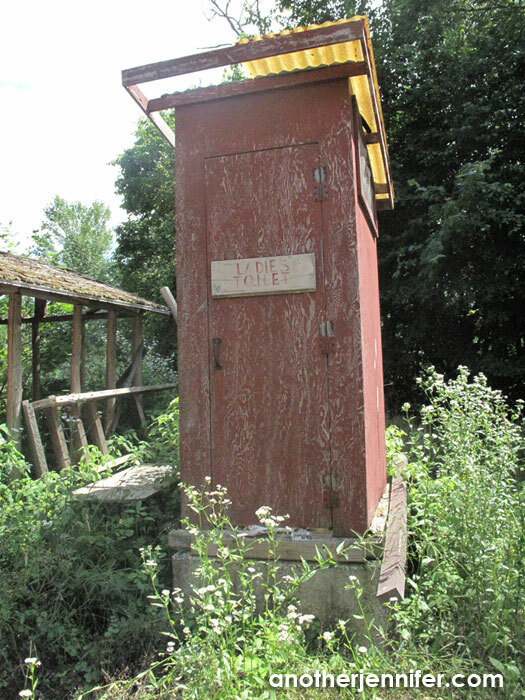 Maybe not the best feature for an outhouse. That’s a great picture – but I’m glad that’s not where I have to use the bathroom! It’s not uncommon to see outhouses in Maine. At least at various summer cottages and camps. I love the faded hand painted sign! That’s all good and well, but woe to the poor woman who had all those layers of skirts and have to use the loo late at night…lol. Cynthia recently posted..Does Thinking About the Future Make You Happier? Ha! Now there’s a dilemma. That step would be killer in that situation. I went to a doozy of a “ladies room” in Yellowstone. It was at 6:00am and on a peak and I had my boyfriend pull over to use it. Tamara recently posted..How This Situationally Anxious Girl Finds Relaxation. I’ve definitely gone in worse. But I survived. I’m just thankful I don’t have to use toilets like this all the time! I agree. Camping can really make you appreciate your home bathroom! You know what I think when I see this toilet? That in many countries – this would be a luxury. Chris Carter recently posted..The Best Marriage Resources for Newlyweds and Seasoned Spouses. It would be, Chris. I saw much worse in Nicaragua. I’m guessing it would work if you really needed it!